The human body is amazing. The sheer number of actions and reactions that occur in our body is mind-blowing! Just think about it for a minute: we don't have to contemplate breathing or blinking our eyes. Our body knows how to extract nutrients from food and discard what it can't use. Our body even knows how to protect and repair itself! Much of this repair and rejuvenation occurs at night, when we sleep. On occasion, though, we get a front row seat to the body's repair processes. For example, if you injure your knee, and it swells or you get a stuffy nose and sore throat in response to an illness, these are examples of the body's natural repair system. They are examples of inflammation! Everything in moderation, right? Inflammation plays a key role in maintaining a healthy body. You have probably experienced acute inflammation in the form of swelling after spraining a joint or breaking a bone. Sometimes this is accompanied by redness or itchiness, and what the body is doing is optimizing the use of the vessels closest to the injury in order to send a surge of cytokines and white blood cells to the area to respond to the injury. The white blood cells are our fighters, sent by the immune system to ward of foreign invaders. They are our protectors, but when they surge to the site, swelling (inflammation) occurs. There is a similar effect with illness or allergens and a stuffy nose. In fact, inflammation is the process through which our bodies grow stronger! We all know that spending time on strength training makes you stronger. But how? Strength training makes tiny tears in the muscle, and when the muscle inflames and repairs itself, it gets a little bit stronger. Through training, you are literally breaking down your body for the purpose of strengthening. The concept is counter intuitive, but this is why rest is so important! It is quite the delicate balance, though, because if you push too hard, the muscle can strain or tear. In this extreme case, the body requires a massive amount of inflammation to repair the injured area and too much inflammation is not so good. Too much inflammation in the area can actually harm the healthy muscle tissue, even while repairing the injured or unhealthy tissue. The balance is the space between having enough inflammation to make the repair but not so much that healthy tissue is being damaged. Similarly, when we get sick, the body sends white blood cells to fight the invaders. The annoying runny nose and mucus-filled throat is actually a good sign. With a healthy body, this means the right processes are occurring to fight the invaders. This process does not last terribly long. However, since inflammation is the general defense against stress (anxiety, pollution, chemically engineered food, etc), our society is walking around chronically inflamed. When the body produces inflammation that is not needed, the excess can actually harm the body. Through pollution, stressful lifestyles and contaminants in our food, we are psyching the body out. Our bodies have been tricked into thinking there is a constant threat, and in response, we get inflammation. So how do we work with our bodies to lessen the effects of this natural response but not hinder the body's ability to respond to real threats? First of all, we must listen to our bodies! Body and soul have to work together - we cannot separate from our bodies, though so many people try. When you feel tired or sluggish or sick, listen to what you need. Take a break. Meditate. Drink a glass of water or eat something nutritious. Are you not getting the nutrients that you need to function well and live joyfully? Are you laughing? That helps bust stress! Anything that helps with stress will also help keep your inflammation levels in check. Many people have a preferred anti-inflammatory medication that they turn to when the body doesn't feel so good. But many of these are not natural options, and could be harming the body in other ways that aren't quite so visible. Our bodies are organic. They are natural and work best with natural solutions. Why not look for more natural solutions to help manage inflammation that is the result of constant stress? At Nature's Edge®, our sole purpose is finding the most natural solutions to every day health issues. Since inflammation is such a HUGE health concern in today's stressed-out society, we have put extra emphasis on finding ingredients in nature that can work with the body to keep its natural defense mechanisms in check. We have four specially formulated supplements that were engineered with YOU in mind! 1.) QUELL-GEL™ is our newest addition to our anti-inflammatory supplements! This proprietary formula uses a synergistic blend of natural ingredients with known anti-inflammatory properties to work with your body's natural processes to ward off unwanted inflammation. It is the most powerful natural anti-inflammation supplement today! 2.) omega-gel® is one of our favorites! Omega-3 fatty acids have long been researched to benefit both the heart and brain, AND our formula has 400 mg EPA and 200 mg DHA, the perfect ratio for maximum benefit! 3.) curcu-gel® uses that famous orange-colored Indian spice, turmeric, in order to reduce the body's inflammation levels. Many rheumatoid arthritis sufferers and athletes have taken this particular supplement to help with joint pain from inflammation. It works great in combination with boswellia too! 4.) boswellia is created using the gum resin of the boswellia tree and is known for having powerful anti-inflammatory properties. Our boswellia uses BosPure®, a superior form of boswellia extract, to ensure maximum absorption! This week, the newest Nature’s Edge® product, QUELL-GEL™, BURSTS onto the scene to help you quell the fires of inflammation naturally! In today’s world, there is no shortage of stress, and our body’s natural reaction to this stress is inflammation. When we are sick or injured, the body sends extra cells to the area of illness or injury to promote healing. This is why scratches turn red, sprains swell, and noses get stuffy. Chronic inflammation, the response to constant stress, does more harm than good, and in today’s world we are constantly stressed. Pollution, anxiety, poor diet, etc. are all stressors. Yikes! In fact, research now indicates that chronic inflammation may be the root cause of so many diseases, from arthritis to cancer. 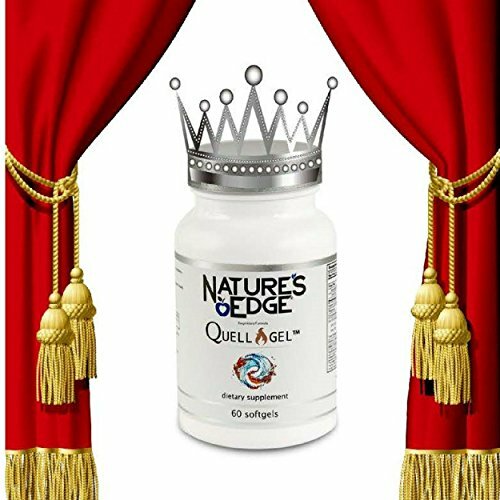 Nature’s Edge® Quell-Gel™ uses a synergistic combination of powerful, clinically tested ingredients carefully chosen from land and sea to assist the body in reducing inflammation. and Quell the Flames Today! Don’t forget to head over to Nature’s Edge® and pick up a bottle to try yourself! It is also the heaviest organ. We are often seeking external solutions for little skin problems, but it is also important to look for underlying causes to skin problems you could be experiencing. Skin tells us when our hormones are off balance, when our food choices have been less than perfect and when we are dehydrated. Actually, it also communicates when we are stressed or anxious. It is a great barometer for overall health! I’m sure we’ve all had acne, rashes and dry skin and immediately reached for acne washes, antibiotic ointments, and lotion. But have you ever thought about trying to attack the problem from another angle? If you read beauty news and blogs, you already know that people have been trying injections and other skin-deep cures for a while. While the promotion of supplements for overall skin health is a relatively new trend, seasoned vitamin-takers are well aware of the long term skin benefits that omega fatty acids, coenzyme Q10 and many others can provide. For example, those who dehydrate easily might have dry skin. Drinking water and using lotion helps, but you are always one hot bath away from snakeskin legs. Adding a fish oil supplement can help! Omega 3 fatty acids nourish and hydrate skin from the inside out, soothing irritation and reducing visible signs of ageing. Ideal for eczema and psoriasis, it helps manage inflammation and calm and heal skin. Antioxidants and many vitamins (A, C, E, etc.) can help keep the cells healthy. They help reduce free radicals and toxins and support the body in preventing damage to healthy cells. By the way, antioxidants are the top fighters against visible signs of ageing. Cool, right? We are not suggesting you give up the lotion, and always remember to apply sunscreen! Simply be aware that youthful, glowing skin should be cared for from the inside out AND the outside in. Visit us at naturesedge.com to learn more about some of these ways to care for your skin! When we discuss cardiovascular health, we think of eating a heart healthy diet full of healthy grains, healthy fats, and plenty of fruits and vegetables. We may also think of a daily exercise regimen that will get our heart rate up for at least 20 minutes. At the top of the list for nourishing the cardiovascular system is a vital vitamin-like nutrient that helps produce energy that allows our bodies to function called Coenzyme Q10 or CoQ10. CoQ10 is particularly important for the heart muscle, as it provides the necessary energy to pump blood and nutrients through the body. CoQ10 is a powerful antioxidant also and protects cholesterol from harmful oxidation, maintains healthy blood pressure and fights free radical damage to arteries and blood vessels. Our cells need it for proper growth and maintenance making CoQ10 such an essential nutrient for cell regeneration and supporting a long, healthy life. Our body’s CoQ10 levels decline naturally as we age. By age 40, our CoQ10 levels are half what they were at 20. Cholesterol-lowering statin drugs can also impair the body’s ability to product CoQ10. Supplementing with CoQ10 is one of the most important things you can do to protect your heart health. Many CoQ10 products on the market today are oil soluble, making them difficult to absorb. Achieving the optimal benefits of CoQ10 is not a matter of how much you take, but of how much CoQ10 is absorbed. Nature’s Edge® q-gel® CoQ10 is a 100% Hydrosoluble™ CoQ10, which is also Liposoluble™(Duosoluble™) - a water soluble and oil soluble form of CoQ10! Nature’s Edge® q-gel® has been clinically tested and has 3 times better absorption and higher sustained CoQ10 blood levels can now be achieved. Nourish your heart today and check out the q-gel® difference! What comes to mind when you think of MAGNESIUM? I tend to think of science. Whether it is biology or astronomy or chemistry, a mental image of the periodic table tends to come to mind. Magnesium actually has many uses and is naturally abundant in humans and in the world around us. Without magnesium, life could not exist. The all-important photosynthesis process would not occur, and the many enzymes in the body would not work. So you can imagine how deficiency of this magnificent mineral affects the body! So how does magnesium help the body? Not too shabby! So how do you make sure you supply your body with enough of this awesome mineral to keep it feeling good? Diet always plays a role in how we feel. Food is fuel, and fuel makes you go, right? Those leafy greens that so many love (or love to hate…kale, yeah!) are a great source of magnesium. If you aren’t into green juice and kale salad, whole grains and certain fruits, nuts, seeds, legumes, veggies and fish also make the list of high magnesium suppliers. Also, even one square of dark chocolate contains a notable amount of magnesium (you’re welcome)! When I was in high school, I hated fish. It smelled. It was scaly. There were tiny little bones, hiding in the meat and waiting to sneak attack you when you least expected. Plus, the dead fish would stare as I walked through the meat aisle in the grocery store. Creepy. Naturally, she looked at my stunned expression and continued with her pitch. “Fish oil has many benefits! It can help keep your heart healthy, your skin hydrated and youthful, and it is supposed to help with memory! It can keep you sharp! Don’t you want to ace your exams?” she asked when she could tell she was getting nowhere fast with me. Flash forward 15 years, and now here I am in the vitamin industry. To be perfectly honest, I have always been a little skeptical of anyone or anything claiming to be a cure-all or magic bullet. But, as I’ve gotten older, I have noticed that when I’m not eating well or dehydrated or even not exercising, my body does not perform the way it used to! The nerve…right? As an athlete, sub-par performance (injury, illness, general not feeling great) is unacceptable. I have one body through which to experience this great world – why not give it what it needs to help me see and do as much as I desire? Two years ago, while training for my first full marathon, I decided it was time to actually take vitamins. Regularly. So, I did. What did I take and what did I notice? I decided to take a standard multivitamin, Vitamin D on the days I didn’t make it outside, a curcumin supplement and an omega-3 fish oil. And you know what? I noticed a decrease in inflammation (for me this came as a decrease in joint pain despite increased activity) and less dry skin! The next question then becomes, am I mentally sharper? Who knows, but with Alzheimer’s in my family, I feel a little fish oil can’t hurt! So…what’s so great about Nature’s Edge® fish oil? · has 400mg EPA and 200mg DHA. These two, crucial fatty acids support healthy heart and brain function AND have to be acquired through diet and supplementation. The human body does not actually produce these two fatty acids. · is specially formulated for maximum benefit and is molecularly distilled and lab-tested to be pure and free of potentially harmful levels of heavy metals, dioxins, PCBs and any other unwanted contaminant. So, if you love curry - eat up and enjoy! Or add this savory spice to an egg scramble, a soup, rice, a salad dressing, or your favorite vegetable. Follow this link - Bon Appetit Turmeric Recipes – for some great turmeric recipes! Simmer herbs and water for 15 minutes, strain out and add honey and milk to taste. Sprinkle with cinnamon. Another excellent way to reap the benefits of this wonder spice is our own curcu-gel® by Nature’s Edge! **BCM-95® is a registered trademark of Dolcas-Biotech, LLC. Turmeric is a spice that comes from the turmeric plant. It has been used in India for thousands of years as a spice and medicinal herb. You probably know turmeric as the main spice in curry. It has a warm, bitter taste and is frequently used to flavor or color curry powders, mustards, butters, and cheeses. But the root of turmeric is also used widely to make medicine. It contains a yellow-colored chemical called curcumin, it is the main active ingredient in turmeric. Curcumin has powerful anti-inflammatory effects and is a very strong antioxidant. Recently, science has started to back up what the Indians have known for a long time - that it really does contain compounds with medicinal properties (1). Curcumin targets multiple steps in the inflammatory pathway, at the molecular level. Curcumin blocks NF-kB, a molecule that travels into the nuclei of cells and turns on genes related to inflammation. NF-kB is believed to play a major role in many chronic diseases (2, 3). Inflammation is extremely complicated and the key takeaway here is that curcumin is a bioactive substance that fights inflammation at the molecular level (4, 5, 6). ***A portion of all sales from the anti-inflammation line will be donated to the Arthritis Foundation. The above list includes just a few of the 100+ inflammatory diseases classified as arthritis. Arthritis is a term I grew up hearing a lot. I did not really understand what it was, but it was clearly on both sides of my family, so whatever this arthritis was, I knew I was doomed to get it. Most of my relatives seemed to have light joint pain and stiffness, typically when transitioning from sitting to standing, but most intense activity (tennis, golf, running, etc) was unaffected to the outside eye. My grandmother actually referred to it as “young person’s arthritis,” because she could play tennis and go to the gym but playing the piano and the first few steps out of bed posed a bit of a challenge. So, what is arthritis? While exceedingly common (50 million+ adults and 300,000 children have it), arthritis is still relatively misunderstood. Often it includes joint stiffness, swelling and pain and tends to be more likely in older adults, but depending on type of arthritis, the symptoms can come and go. The most common type of arthritis, Osteoarthritis, typically happens over time, as the cartilage between joints wears away. With no cartilage left, the joint is simply bone rubbing against bone, which is obviously painful. In mild to moderate cases, symptoms can be managed by maintaining a healthy weight, regular physical activity, strengthening muscles around the joint, anti-inflammatory diet or medicines, etc. Unfortunately, those who have had injuries are more susceptible to this type of arthritis as they age but keeping the inflammation in the joint to a minimum is key to minimizing long-term effects of injury. How do you know if a joint is inflamed? As a former figure skater, I took quite a few falls. Most of them were harmless, but some had lasting effects. Still, sixteen years later, there are mornings when I can tell there is some inflammation in my lower back or knees. Typically, the area is extra stiff and sometimes moving is painful. On those days, I roll out of bed and immediately do some yoga poses and stretches to get some oxygen flowing to the area. The key for me has been to keep moving. The more I move, the better I feel! Another key is to keep inflammatory foods to a minimum. After a night of pizza and beer or fried food and wine, I am sure to have a harder time getting out of bed than on nights when I have limited alcohol consumption and eating a healthy, balanced meal. Swelling is another sure sign a joint is inflamed, but luckily my inflammation rarely gets that far! What can you do about it? A healthy lifestyle helps a lot! As I mentioned, movement and a healthy diet are key components in living with arthritis, and there are different medications commonly used to treat different types of arthritis. However, before turning to medication, it is worth exploring the different supplements out there that can decrease inflammation and help with those arthritic symptoms. Nature’s Edge offers three great options! First, there is boswellia, a powerful anti-inflammatory from the resin of a tree commonly found in India and the Middle East. Next up is curcu-gel®, containing curcuminoids from the almighty turmeric spice. These two supplements are frequently taken together for maximum anti-inflammatory effect. Lastly, we have omega-gel, a highly purified, wild-caught omega 3 fish oil supplement. We are currently working on a fourth option, which will be a sort of Rolls Royce of anti-inflammation supplements. In fact, when ready, it will be the most powerful anti-inflammatory on the market! Visit us at www.naturesedge.com/ for updates on this very special addition to the anti-inflammation line! **A portion of all sales from the anti-inflammation line will be donated to the Arthritis Foundation.